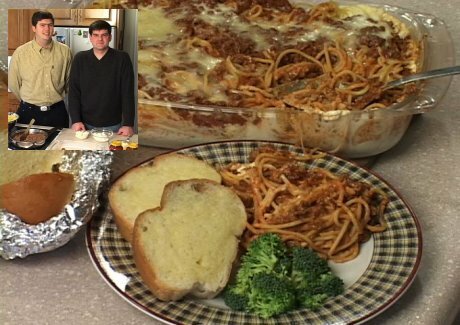 Michael Smith shows Dan how to make Spaghetti Casserole. Click here (56k) to watch the video. If you have a high speed connection, click here (300k) to see a higher quality video clip. In a separate bowl, bring cream cheese and sour cream to room temp and mix until smooth and combined. In a skillet, brown hamburger; drain. Stir in spaghetti sauce and simmer for 10 minutes. Cook and drain noodles according to package directions. In a greased 9-1/2 x 11-inch pan, spread the cream mixture. Next layer half of the noodles, hamburger sauce, and cheese. Repeat layers. Cover with foil and bake at 350-degrees F. for 1 hour. To Freeze: (Line entire pan with greased foil prior to layering ingredients. After casserole is frozen, remove hardened casserole in foil, wrap and label). Prior ot baking or after baking, cover casserole tightly with aluminum foil; label and date. Write cooking instructions on foil. To use, thaw in refrigerator overnight and then bake as directed if not yet baked or simply reheat in microwave if previously cooked; or, to cook directly from the freezer, bake for 1-1/2 to 2 hours at 350-degrees F.